Are you one of the millions of people who use the age-old excuse:< “I don’t have time to exercise”? When you work full-time, it is hard enough to find a work-life balance, let alone find the time to fit in the gym. Not only that, but it has recently been said that sitting for long periods of time can be more harmful thank smoking. There are lots of small under desk elliptical that deliver great results without breaking the bank or thinking about standing desks. To help you find the one the is best for you, here’s our reviews guide to the best under desk elliptical bikes. The Cubii Pro is one modern under desk elliptical! More people are taking an interest in their health and setting goals for themselves in the form of fitness trackers, like a FitBit. This under desk elliptical recognizes that trend, making sure you can document all of your work with help from Bluetooth that is built-in. With the free Cubii Pro mobile app (IOS – Android)you can set yourself goals and track your progress thanks to Bluetooth. In fact, thecubii under desk elliptical is the only Bluetooth-enabled under-desk elliptical on the market. You can even share your progress and compete with friends (perhaps a friendly competition in the office is in order) or even with strangers around the world to give you that motivation to keep active. You’ll also know how many calories you have burned and miles completed that day. This data can be transferred over to your Fitbit too, making sure you get an accurate picture of your progress on there. This technology is something you may expect from a larger machine, not a small under-desk elliptical, but this little piece of equipment packs a punch. 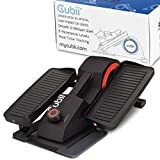 The Cubii Pro won last year’s Good Design Award due to it being ergonomic, allowing you to keep a great posture with no slouching ensuring your knees don’t hit the top of your desk. There’s less impact on the knees as well compared to most bike desks. You’ll still get the same great workout at your desk, burning 120% more calories than you would by just sitting. It is a bit on the larger side when compared to other under desk ellipticals and steppers, and weighs about 27 lbs. but thanks to the sleek design, it will still fit and make sure you have no bruised knees whilst using it. Some reviewers expected it to be smaller but it measures 23 x 11 x 9 inches, but this is still smaller than others on the market. If you have a swivel chair, it comes with a chair stopper to help keep you in place while you work the pedals. Cubii’s pro elliptical is one of the more expensive under desk ellipticals on the list. The Cubii Pro will need to be charged if you are using the Bluetooth function, but this is only once every few months. The Cubii Pro is an under desk elliptical for the tech-savvy fitness person who is determined to stay active despite a 9-5 desk job. It is also perfect for those who may have problems with their knees but still need to use and build muscles. There are some definite advantages to using this machine. It’s not only designed well but is also extremely compact and fully adjustable. Not everyone has time to hit the gym every single day. Whether you can’t find any wiggle room in your schedule or you simply wish to start multi-tasking more effectively, the Stamina InMotion compact strider elliptical is an awesome way to accomplish your fitness goals. It does a great job of saving users space, time, and money. Since it’s a cardio machine, you’ll be able to get your heart rate up and burn calories continuously as you work or game. It’s ideal for homes or offices. The virtually silent operation allows you to use this elliptical discreetly so you won’t draw any stares from your co-workers. It is also very simple to use. You may not even notice you’re working out after you get into a good rhythm. Since it’s a low impact machine, you don’t run the risk of damaging your knees, hips or joints. That’s fantastic news for anyone who hates treadmills. Finally, this strider has a convenient carrying handle making it totally portable and easy to put away when you’re done. Do keep in mind that while this elliptical is compact and easy to use, it lacks range. You will need to find an alternative solution for large muscle groups like hamstrings and glutes. It is however fantastic for increasing stamina and balance. Additionally, this well-built and durable machine is heavy. You won’t want to carry it to and from the office every day so if you don’t have somewhere to store it, this may not be the best option for you. Other than that, this is a great choice for gamers and desk workers to consider. Carrying Handle – The carrying handle makes this a very portable and easy to store under desk elliptical option. Compact Design – Users can save space with the compact and efficient design of this elliptical. Quiet – This machine is quiet enough that you could use it in an office. Durable – This is a durable and well-build machine. Low Range of Motion – While this machine is great for cardio and stability, it will not help you bulk up large muscle groups. Heavy – Don’t plan on carrying this baby around all of the time (unless that’s how you want to work out your biceps) because it’s pretty heavy. Verdict: This is a fantastic option for seak workers and gamers to consider. It’s compact and well-designed, with durable components and silent operation. It also is a fantastic way to get a cardio workout in while increasing stamina and balance. This machine is, however, pretty heavy and it isn’t ideal for building large muscle groups. 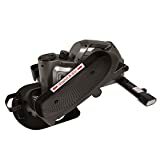 For users who plan to use their compact elliptical trainer on a very consistent basis, this product may be well worth considering. While it is more expensive than many similar options, it’s also of higher quality and has more features. This durable elliptical has been designed to stand up to constant wear and tear. It also has a very helpful display monitor that can give you readings during your workout and help you track stamina and progress changes. The intensely smooth gliding motion of this elliptical makes it virtually silent. Your joints and knees will thank you. All around, a great product, though a bit pricey. Please note that some assembly is also required with this option. That being said, the assembly is pretty easy and doesn’t take long. A Bit Pricey – Comparatively, this elliptical is more expensive than many similar models. Assembly Required – Some assembly will be required if you order this new. Verdict: This is a very nice under the desk elliptical that has lots of bonus features and is very comfortable to use. The extremely quiet and smooth operation makes it a favorite of many office workers. It’s also well balanced and designed with quality materials. While this machine does require some assembly and is a bit pricier than some of its competitors, it’s a good option for anyone who plans to use it continuously. It functions well and is quite durable. FitDesk is a brand that is true to their name, designing products that help you stay as active as possible whilst at your desk, so you know you are getting something that keeps all the aspect of office life in mind. You’ll see this with their under desk elliptical too. The design of the FitDesk Under Desk Elliptical machine is suitable for desks that are as low as 25 inches. This is the lowest pedal rotation height available on the market. No bruised knees here. There are eight different levels of resistance, and it allows for handsfree tension adjustment (you can adjust the tension levels with a foot shifter). The desk mounted meter will give you all of your stats from your desk workout, including calories, burned, time, speed, and distance all right on your desk for easy access. You won’t have to stop and look at the elliptical for your progress. There is also a built-in lock wheel for those swivel chairs. Transporting is easy with the grip handle and chair wheel. It weighs 35 lbs. with its steel frame, which can be heavy for some. A Grand handle and builtin wheel makes it easy to transport. It measures 34W x 20D x 12H inches which seem quite big considering the pedal only goes a maximum of eight inches. The FitDesk Under Desk Elliptical is a decent pick. It shows you everything you would want to know about your progress for the day without any extra frills or even needing to bend down to adjust anything. It’s especially a great choice for those with small desks. There is a built-in rolling foot massager for those aching feet. A big metal plate keeps the FitDesk in place. You can do everything with your feet, including adjusting the resistance! It is very quiet, but some users have reported a squeak after using it for a while. This is said to be fixed with a quick spray of WD-40 but may need doing often. The DeskCycle Bike Pedal Exerciser will give you more cycling action then stepping. This will give a slightly different workout than stepper due to working a bit more muscle (better to lose weight). 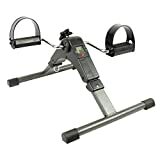 This pedal exerciser comes on a stand, with the front leg measuring 20 inches to keep the exerciser from rocking, with help from the low profile. There are straps on the pedals to keep your feet firmly in place whilst exercising. There is a 39 lb. flywheel weight and touchless magnetic resistance that provides a smooth and quiet motion. The pedals stand at 10 inches at its highest point, making this suitable for even small desks at 27 inches and above (prevents your knees from hitting, even if you have a keyboard tray). You can strap your feet in, but you may need to keep pulling yourself towards it if you have a swivel chair. You will need to find a good position for you and lock your chair in place yourself using wheel locks if your chair has them. The display stand can sit on your desk to keep track of your progress. While it will show you roughly how many calories were burned, elliptical machines like this are not always accurate since many factors determine how many calories have been burned like your weight/height and resistance. DeskCycle has recognized this though and has an online calorie calculator where you can put in your weight/height and details of your workout to give you a better idea. The team at DeskCycle say they have the option to going online to do this rather than giving the option to program it into the machine is due to attempts at keeping costs down. The different levels of resistance on here make it suitable for everyone. Many have said it gives them something to aim towards. If you want a workout that is a little bit more intense than an elliptical, then give DeskCycle a try. The DeskCyle has eight resistance levels, twice as much as other under desk exercise bikes on the market. It is lighter than other under desk cycles/ellipticals at just over 20 lbs. It is extremely quiet, with reviewers suggesting it is even silent. There is no wheel stopper like other machines. You have to manually turn a dial to be able to change the levels. The Stamina In-Motion Elliptical Trainer is indeed an economical choice of under desk elliptical. That is because of its no-frills design. It constructed out of steel with non-slip end caps on the bars to keep it in place. You can adjust the tension, but this is at the front of the machine. If you wanted to make an adjustment, you will need to do it manually with the dial at the front. The LED display for time/calories/strides is also near the same place at the front, which may make it hard to read without getting down to the same level. It isn’t exactly the most portable design, but if you were transporting it to and from work in a car, then that would be better than trying to drag it on public transport since it does not fold down… Better suited to stay at the bottom of your desk. Stamina’s elliptical doesn’t have long strides and is very easy on the joints. This is a desk elliptical enjoyed by those who have been in chronic pain and the elderly for that reason. 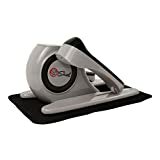 If you are looking for a straightforward under-desk elliptical to just get the legs moving during the day, then the Stamina In-Motion Elliptical Trainer is for you. It’s a good choice for those on a budget, but wanting to try out an under desk machine during the day. It is also a good no impact, short stride workout for those who may have joint issues. Can be used standing up. Easy on the joints, especially when sitting down. Very Affordable, A Decent Budget option. Many have suggested it doesn’t last as long if you choose to try it standing up. Here is another motor assisted elliptical that comes with three speeds of low, middle, or high. You don’t need to worry about numbers, or different manual modes, just your simple three basic levels, and active, moderate, or light for the assisted modes. The foot pedals have anti-slip grip, and pretty much any type of footwear can be used on it, even your slippers! There is an anti-slip floor mat as well that comes with the machine to keep it in place. The digital monitor is bright, which is probably needed due to it being attached to the machine. You may have a hard time reading it if it was under your desk. The Sunny Health and Fitness Peddler weighs only 16.5 lbs. and measures 20 x 15 x 10.5 inches making it a very compact choice of motor assist cycles. This is a good motor assisted elliptical that isn’t too complicated with lots of different programs and modes. If you just want to pedal and find motor assisted is beneficial to you, then this is the best choice. This comes ready right out of the box. No assembly required. Just plug and go. The built-in carrying handle makes it easy to pick up and move. The Sunny Health and Fitness Peddler shuts off automatically after 30 minutes. Jfit’s version of the under desk elliptical is also great for standing up on, and it is certainly sturdy enough for it. The pedals are adjustable to make it comfortable for either standing up or sitting down.The magnetic wheels on the machine are large, making it a very smooth glide while using. These same wheels have been the culprit of a bit of squeakiness from time to time, but there is some oil that comes with the machine to help stop this. There is a handle on the top for easy carrying although it is a bit bulky and can be difficult, which is why Jfit also put wheels on the front to help move easily. There is a standard dial to adjust resistance and a small digital screen for your stats. The location of this is a bit awkward for when you are sitting down, but better when standing up as it swivels around. If you were using it to stand up, although it would be difficult to read while working out standing up. This well-built model is very easy to use, stays in place, and gets the heart going. The Jfit Under Desk Elliptical tries to have the best of both a stand-up and sit-down elliptical. If you wanted one that allows you to do both, then this is a good strong model, but if you are looking for something for just under the desk, there are other models that are more suitable and with lower price tags. Very versatile with the stand up and sit down modes. Comes with oil just in case it starts to get squeaky, but otherwise, it is very quiet. This Pedal Exerciser by Vive may look like a big, clunky machine, but really, it weighs less than 15 lbs. and about 16 inches long x 13 inches high x 16 inches wide. There is a handle at the front where you can just pick it up and go. It does not fold down at all for transport, but it is quite lightweight. The anti-slip (and anti-scruff) rubber feet keep it in place, and with help from the straps on the pedals, you should stay in place. Resistance is controlled by a dial at the front of the machine. The LED screen has one button to jump between screens showing your basic stats. It is also quite big and easy to read, so although it is attached to the machine and not detachable like some others, it is easy to get to and read. Looks and price tag may be deceiving here. It looks big and heavy, but it is lightweight and stays in place while pedalling. This is a good economical choice of under desk bike peddler. Has been recommended by physical therapists due to its ease of use and readable LED screen. The straps are not very adjustable. Those with bigger feet have said they had problems fitting their shoes into them. The Marcy Cardio Mini Cycle has a good, sturdy tabletop design for use on both arms and legs. The LED display will run a scan through all of the workout’s stats, but it is quite small. This may be due to saving on costs since the price tag of this mini cycle is very low-priced! Marcy’s mini desk bicycle weighs only just over 10 lbs. and has a built-in handle. It isn’t very bulky, so it is very easy to transport. It doesn’t move around when peddling, but there has been some issue with the tension with the friction belt stretching as it seems to loosen a bit after a while. This may not be an issue for someone who is only looking to get the blood moving and not necessarily challenge themselves. It can be fixed, but it can be a complicated process. It’s very simple, and for the price tag, you can’t really beat it. There is nothing fancy about the Marcy Cardio Mini Cycle, but do you need it to be? If you need something basic, this is a great price for a mini office bike that has a great design and stays in place. The tension control seems to give way a bit for some users. There is a maximum weight limit of 220 lbs. This is lower compared to other under desk cycles. The pedals have no straps. Can you really get a workout with these, while sitting at your desk? You may not be breaking a sweat, but it is possible to get more fit with an under-desk elliptical. You are using muscles you would not normally use, keeping the blood flowing and your energy levels up, burning calories. These are perfect for more muscle endurance rather than building though. The exercise also boosts your mood, making those Mondays at the office not seem as bad! How many extra calories can I burn with a desk cycle? This will vary from person to person, but you will generally burn 120% more calories than you would by just sitting. This is on average 150 calories. While this may not seem like a lot, it is definitely more than you would be without a desk cycle/elliptical. It won’t give you the workout of a lifetime, but if used just in work every day, that’s still an extra 750 calories burned a week! What is the minimum desk height? Each machine will vary with their recommended desk height to make sure you have a comfortable range and don’t hit your knees, but the lowest on our list is 25-inches with the FitDesk Under Desk Elliptical Trainer. Of course, your own height, as well as the height of the chair, will factor into this too. If you are taller than 5’7”, then consider taller desks to have a comfortable workout. Is an under-desk stepper better? This depends on the individual. A mini stepper is like climbing stairs. There is a moment where the leg is nearly fully extended before moving up again. This has a slight impact to the knee joint. Over time, this can become damaging if proper recovery time is not taken. An under desk elliptical works by a more gliding movement. There is continuous movement and no impact on the knee. Both machines work the same muscles (glutes, quadriceps, hamstrings, and calves) but the biggest difference is in the impact in the knee. If you have joint issues but still want a workout, then the elliptical is a better choice as a stepper could cause some pain. If you do not have any issues in the joint, then a stepper should be just fine. Just be sure to give your body tie to recover, so no joint issues form in the future. Yes! Many under desk ellipticals are easy to fold up and transport with handles. Some of the best ones even have wheels on them if you find it too much to carry. Take your workout with you back home to enjoy while sitting in your favorite chair back home. Sitting at your desk for long periods of time is not healthy physically and mentally. Under the desk, even the best ellipticals won’t necessarily get you sweating. But while they are not as efficient as a desk stand for weight loss, they still offer a good daily workout when otherwise you would just be sat at your desk. They get the blood flowing and boosts your mood all while burning calories. Hello.Can you tell me where I could eventually purchase “The Motorized” Under THE desk Elliptical?.I have seen it on Overstock (too expensive with Shipping cost)and on the Sunny health website, NO MENTION of being able to purchase from them as a private person..You seem to KNOW..So let me know WHERE I can buy one, to be sent to SWITZERLAND, if I can find a WEBSITE with this Fitness machine, Thank you. Please check the products in this list, most of them are available in the US and Europe. I don’t know the particular product you mentioned. Under-desk elliptical vs normal bike – how do they compare for weight loss? The most important factor in weight loss is consistency. You can achieve results using either an under-desk elliptical or an under-desk bike but only when you use them consistently. In addition to consistency, intensity is important. Both elliptical machines and bikes come with varying degrees of intensity. If you want your under-desk exerciser to lead to weight loss, it’s important to buy one that has several resistance levels. This lets you change up how hard your workout is. At higher levels of resistance, you will burn more calories which can help your weight loss efforts. There are a few other factors to consider as well. When you able to easily track your progress, including how many calories you have burned, it can help you commit to your weight loss goals. The Cubii Smart elliptical, for example, includes Bluetooth-enabled data tracking. When you able to easily track your progress, including how many calories you have burned, it can help you commit to your weight loss goals. Even equipment that isn’t Bluetooth-enabled can help you track your caloric burn, like the DeskCycle Desk Exercise Bike Pedal Exerciser with its data display screen. With both under-desk ellipticals and under-desk bikes, you will be burning more calories than you would by just sitting.